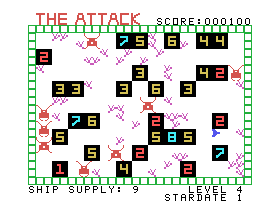 The Attack Prototype from Milton Bradley. 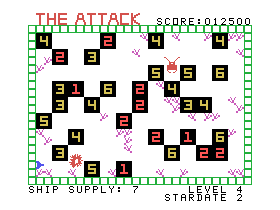 Ah, one of the classic TI-99/4A games! Most of you out there have probably played this one or remember someone at some point playing it who had a TI system. Basically, the object of the game is to blast orange aliens which can hatch out of black incubators once their counter reaches zero. In addition, harmless purple spores fly about the screen which also must be gotten rid of, because when four gather they form into an alien. It's a really entertaining game and another one of those great releases from Milton Bradley. The Attack has some interesting history behind it. 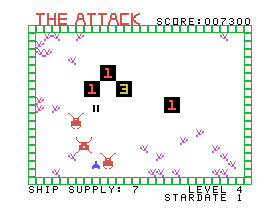 According to two different sources from Milton Bradley, the game was either to be a tie-in with the 1979 Alien movie, and therefore sold under the title Alien, or the original name was to be Alien Attack and due to legal reasons the name was changed to The Attack. Most likely the former is correct, since Milton Bradley used licenses for its other two 1980 releases (Hustle and Blasto, translations of Sega/Gremlin arcade games) and the licensing of a movie would make sense in this case. Also, there were games that used "Alien" in their titles for other systems at the same time period and they never encountered copyright problems. 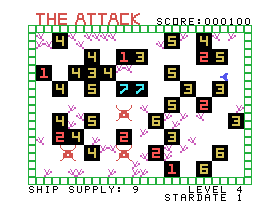 The main thing that is different in the prototype version of The Attack is the music at the beginning of the game. The proto has creepier music, which would actually fit in with the Alien movie well. Also, the sound played when an alien appears is different and goes good with the creepier music. Intererstingly, the music that plays in the background of the released version of the game (not to be confused with the theme song which only plays at the beginning of the game) retains the thumping/beating that is present in the prototype theme music, so Milton Bradley must have liked that part of the theme enough to use it as in-game music. One other noticeable difference is the number of aliens that hatch directly from the incubators in the harder levels. In the prototype, only about half the time do aliens hatch directly from the incubators on the pro level of play (the other half of the time purple spores are released). This is compared to what seems like 100% of the time on the same level of play in the released version.